Geiser Maclang | Here's to Life! Bridge the Generation Gap by Making Lolo/Lola Tech Savvy! Kids now are so techy savvy that their whole life revolves around computers and the internet. My own kids would rather be online than watch TV these days. And when school’s out, like today — the last day of exams, they are with friends at the nearest internet cafe to play games. Their interests and lingo have become worlds apart from those who have remained in the era before the advent of computers. I am one of the lucky parents who have kept pace with our children in terms of technology use. But when I go to visit my Mom who is in her 80s, I still see a person who does not know how to use a mobile phone, writes letters by hand and sends them via snail mail, and does most of her written activities with a pen and paper still. She prefers it that way but it also saddens me since there is not much common interest to keep conversations going between her and my kids for long. After a while, my kids drift off to their own conversations while Mom ends up conversing with us, her children. Then, just the other day, I got the surprise of my life when Mom’s decades-long American penpal added me up on Facebook. It really made me think that if only my Mom (who is now widowed) became comfortable using a computer, how much more meaningful her life could be if she had direct contact with all her friends and relatives instead of being limited to snail mail. In the book “The Five Things You Must Discover Before You Die”, author John Izzo wrote about cultures that have lost this connection between the young and the old. This can be observed mostly in cultures with very advanced technology. Tribes and clans, where the senior citizens continue to play a large role in leading and are looked up to, are few and seem to be a dying tradition. And yet, Izzo discovered that in talking with the seniors to gather data for this book, there was a richness to the wisdom and life experiences of the seniors that the youth would truly benefit from. Likewise, seniors seem to gain back some of their youthfulness and vitality when engaged with the very young generation. MUSIC was the generation gap of my youth. My parents could not understand the “noise” that my friends and I would often love to listen to or dance to at discos. In the generation of our children, the generation gap is TECHNOLOGY. How do we get the very young communicating again with their much older family members? Bayan Telecommunications conducted an informal poll via Plurk and Facebook (2 social networking sites), which revealed that, given the chance, 87% of young people want to continue communicating with their grandparents (lolos and lolas). This same poll revealed that 81% of Filipinos are still close to their grandparents and 57% still visit from time to time. And yet, ironically, the Internet Age is also responsible for further widening the generational gap between a younger set that is used to the internet as a communications and research tool and an older generation that does not know where to begin and is in danger of being left behind. This realization became the foundation for Bayan’s newest advocacy, Teach Lola – an initiative to bridge the communication gap between the younger and older generation. This advocacy rides on the initial resounding success of Lola Techie, who has been seen in tarps all over the metro besides TV ads. Lola Techie aims to show that senior citizens are just as capable of enjoying the benefits of the internet just as the generations after them. “Project Lola endeavors to teach the older set about the computer and the internet. It offers training on such diverse topics as how to operate a computer, where to find the appropriate icons to click, how to write and manage e-mail, how to go about instant messaging, and how to navigate the intricate world of social networking sites,” Tunde Fafunwa, Chief Executive Officer of Bayan Telecommunications, shares. 2. An official website (www.teachlola.com) where anyone can download manuals for free. For the first wave, Bayan employees’ grandparents were the first targets. 20 trainers from all departments in Bayan were taught by teaching partner, Learn.ph, to educate the targetted grandparents as well as spearhead events that will aim to bring more apos together with their lolos and lolas. Aside from recruiting more people to become Teach Lola trainers, Bayan is enabling other people as well to participate through a do-it-yourself process. An online manual is available at the official website which anyone can download. Anyone can likewise update the Teach Lola modules, akin to how user-generated updates are done in Wikipedia. This means that more people nationwide and globally can get involved in this initiative. It is really not far-fetched that lolos and lolas will eventually latch on to the internet. Lola Techie’s presence on Plurk, Facebook, Twitter, Multiply and YouTube gives us a glimpse of what could be. And guess what! A large majority of her followers are my kids’ generation! Just 2 months into the launch of Lola Techie, she already had over 90,000 Facebook fans, more than 4,000 Multiply contacts, and almost 2,000 followers in both Twitter and Plurk. This does not include hundreds of thousands of views of her videos on YouTube. And Lola Techie interacts with all her contacts on these sites. Imagine what it would be like for your children and their grandparents — sitting together in front of a computer, interacting and playing or chatting! How wonderful that would be to behold. I am personally very happy that such an advocacy is being launched. I hope we can really get many of the youth involved to bring what comes naturally to them to their grandparents, for whom this can sometimes be a very intimidating obstacle. Urban Time, the country’s upcoming and hippest watch boutique, introduced its 5 brand ambassadors to the bloggers last March 25. The search for 5 young girls to become the icons of Urban Time were launched on the web. Part of the scoring came from online votes while another part came from 3 judges, one of whom was my good blogger friend, AJ Matela. Last year, in order to get my 2 girls the planners they wanted, I was at this coffee shop almost daily ordering a cup of coffee. This year, though, I told myself I would not do that. After computing the cost of daily coffee at that shop, I figured it was an expensive way to buy a planner. But I have changed my mind after attending the blogger event hosted by Coffee Bean & Tea Leaf (CBTL) at Boni High Street. I confess I had no idea what the event was all about except that I was drawn to the word “Giving” in the text I got from Geiser Maclang. C1 came along with me. As we entered CBTL, we were surprised to see bloggers huddled around tables talking with people who had brochures laid out. That was how I found out that CBTL was launching its Christmas program, 12 Cups with The Coffee Bean & Tea Leaf: Give in to Giving. At each table were representatives of each of the 12 organizations being supported by CBTL this Christmas. Here’s how it works. Every cup of coffee or tea you buy, which is covered by the program, gets you a stamp on a card. 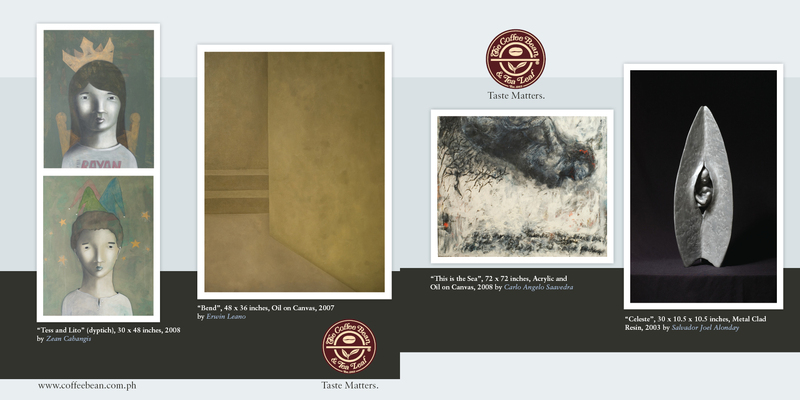 Once you complete the 12 stamps on the card, you get to choose your favorite cause/advocacy from the 12 supported organizations and CBTL will make a donation in your name. Not only that! 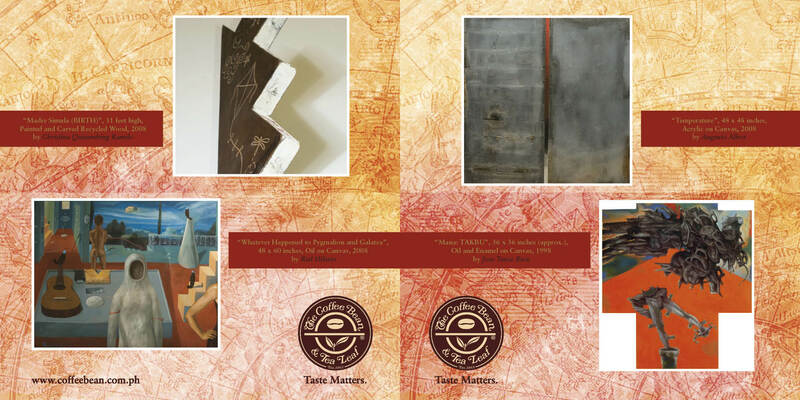 For having completed the card, you also get one of the 3 CBTL limited edition commemorative journals specially designed by 12 of the most important Filipino artists in the country today — FREE! And if you get to donate to all 12 organizations (that means 12 cards x 12 cups = 144 cups), CBTL will give one year’s supply of coffee! 1. Kababaihan Gabay sa Bayan (KAGABAY) – poverty reduction through social, political and economic empowerment of women. 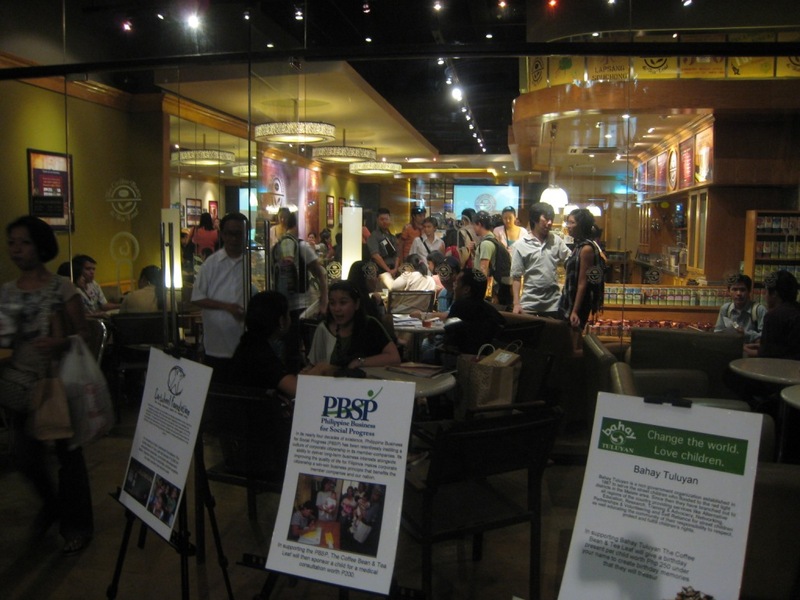 CBTL will donate P600/child for their education needs. 2. The Restorative Justice Program of Caritas Manila – service to prisoners and their families through formation, paralegal assistance and outreach. CBTL will donate P1,000 under your name for values formation class materials per school year for inmates. 3. The Philippine Animal Welfare Society (PAWS) – animal protection and care. CBTL will provide medicine for animals under PAWS’ care. 4. Bahay Tuluyan – serves streetchildren. CBTL will give a birthday present for a child worth P250 under your name. 5. Haribon Foundation – conservation of Philippine biodiversity. CBTL will adopt a seedling under your name. 6. Cartwheel Foundation – education for the country’s indigenous people. CBTL will donate P8,000 for educational materials, curriculum development, tuition, teacher training & seminars, and school supplies for each student per school year. 7. Kythe Foundation – supports children with cancer; its Child Life Program seeks to alleviate the anxieties of a child during hospitalization. CBTL will sponsor an unforgettable kids’ outing for the kids and the volunteers. 8. Autism Society Philippines (ASP) – committed to the wellbeing of persons with autism spectrum disorder. CBTL will donate P2,000 for books needed for autism disorder awareness. 9. Philippine Cerebral Palsy, Inc. – aids cerebral palsy victims. CBTL will give a patient P1,800 per month to help in their medicine and rehabilitation. 10. Philippine Band of Mercy (PBM) – attends to indigent Filipinos suffering from cleft lip & palate, congenital cataract & glaucoma, hydrocephalus & meninggoceale. CBTL will give P8,000 for the operation of each child & become the leading provider of comprehensive craniofacial health services for the less privileged. 11. Resources for the Blind – seeks to ensure that blind students have access to the same information that sighted students have. CBTL donate P1,000 for the production of Braille textbooks. 12. Philippine Business for Social Progress (PBSP) – seeks to improve the quality of life for Filipinos through corporate citizenship. CBTL will sponsor a child’s medical consultation worth P200. 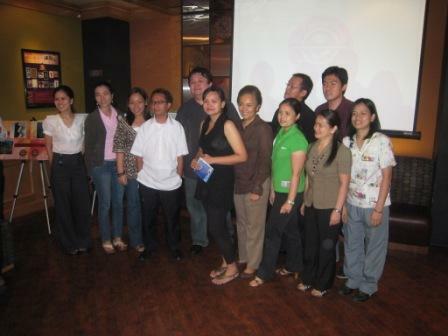 I had the chance to speak with Coffee Bean’s Marketing Director, Paolo Del Rosario, who enthused about the program. I told him that I was very touched by their gesture to support not one but TWELVE NGOs. And Paolo assured me that this is going to be a yearly thing with CBTL and not just a one-shot deal. Much later, I also had the chance to meet CBTL’s Managing Director, Walden Chu, who was likewise very enthusiastic about their program. If I had to spend my money on coffee, this is were I would plunk it down. Not only do I actually enjoy CBTL’s coffee and tea (Chai Latte and African Sunrise are my all-time favorites) but their food fare, for a yogini, is very healthy and tasty. There is a CBTL on the ground floor of my yoga center and we would often hang out here before or after classes over cups of coffee or tea. With The 12 Cups of Giving program, CBTL has earned my respect and admiration — not just for their good food but more so, for their generous hearts for the marginalized among our citizens. A big THANK YOU to Coffee Bean and Tea Leaf for giving us good coffee, tea and food while giving us this rare opportunity to give back a little of ourselves to society as well. 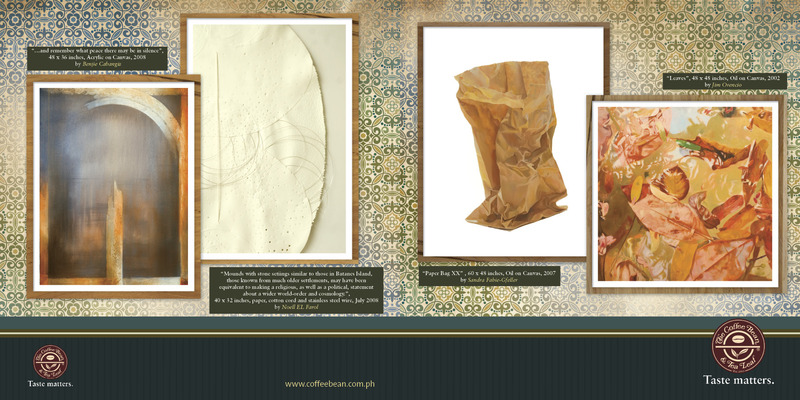 The Coffee Bean and Tea Leaf is located at TriNoMa, SM The Block, Gateway, Ortigas Park, Paseo Center, Bonifacio High Street, Mall of Asia, convergys Ayala Avenue, Salcedo Village, Alabang Town Center, Rockwell, Robinson’s Ermita, Greenhills Promenade, Robinson’s Galleria, Eastwood, Tomas Morato and 2 more branches in Cebu.